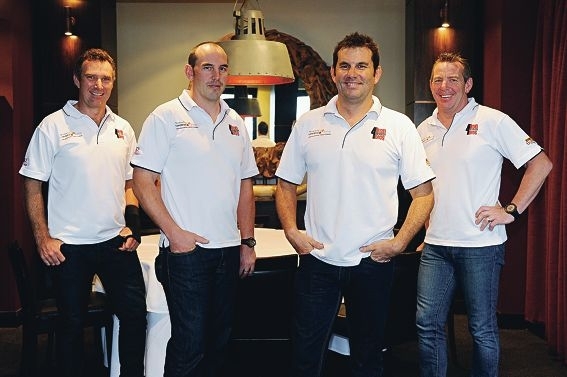 The Aubin Grove resident, whose four-year-old daughter Georgia has a mild form of the disability, raised the money with his four ‘Ironbros’ who competed at the recent Ironman Asia-Pacific Championships in Melbourne. The Ironbros team, consisting of Mr Farnan, his brothers Paul and Chris, and friend Matt Weeby, first competed in an 85km bike ride during last year’s Cerebral Palsy Awareness Week. That event helped the team raise $68,000, which was donated to the centre. The four teamed up again for the recent Melbourne Ironman, with Chris unable to compete but substituted by friend Ross Young who finished the race in less than nine hours. In the lead up to the race, the team was able to raise a further $48,000. ‘One of the benefits of fundraising has been the chance to educate myself and others about the disability,’ Mr Farnan said. Mr Farnan said the money raised would go towards purchasing and modifying equipment for people with cerebral palsy. ‘When I first started learning about the disability I didn’t know how much equipment people needed,’ he said. ‘The government provides the main mobility equipment, which could be a $50,000 wheelchair or in Georgia’s case a $500 walking frame. ‘But some people also need special equipment to sleep at nights, modified wheelchairs, walkers, treadmills. The team also competed at the Centre for Cerebral Palsy’s annual Wheelie Big Day Out charity run at the weekend.